Sooner or later we will be seeing devices/gadgets that work with windows store apps (both on windows phone and windows – WinRT). In most of the cases, the logical interface device would be a Bluetooth module. 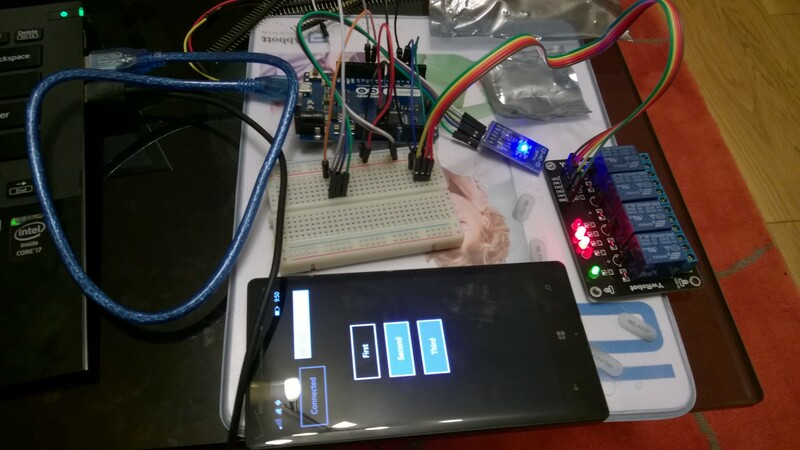 I have been toying around with the idea of making a controller for my aquarium for a while now and it seemed like a great opportunity to build my own gadget that can connect to my phone and tablet using the devices API. So I decided to start by building a small circuit that can receive and transmit data back to the devices at hand. For my aquarium controller project, I ordered a number of circuit elements and as the micro controller for this gadget I chose Arduino (well actually Leonardo but all the same). Together with the other sensors and relays, I was able to get a good deal for a Bluetooth module that can act as a slave and a master. (HC-05). HC-05 module comes equipped with 6 pin interface. (VCC, GND, TXD, RXD and two pins that I will not make use of in this example, LED and KEY). Essentially, the power input and one pin for transmit and one for receive. It is defaulted to slave mode and the default pin was 1234. 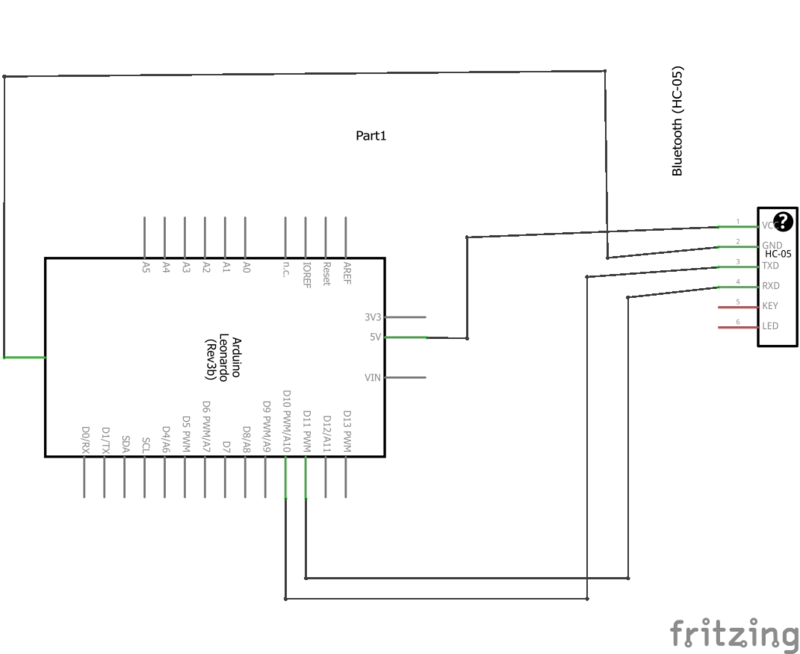 I am not going to go into detail but the circuit diagram should look similar to the one below. 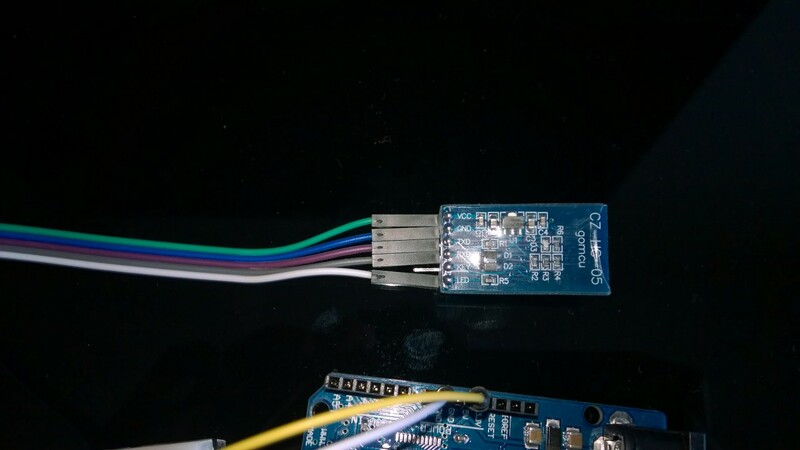 As you see we are connecting the data in/out pins of the Bluetooth module (purple and grey) to Arduino digital pins 10 and 11. The VCC is connected to the 5V pin of Leonardo and GND is connected to the ground. 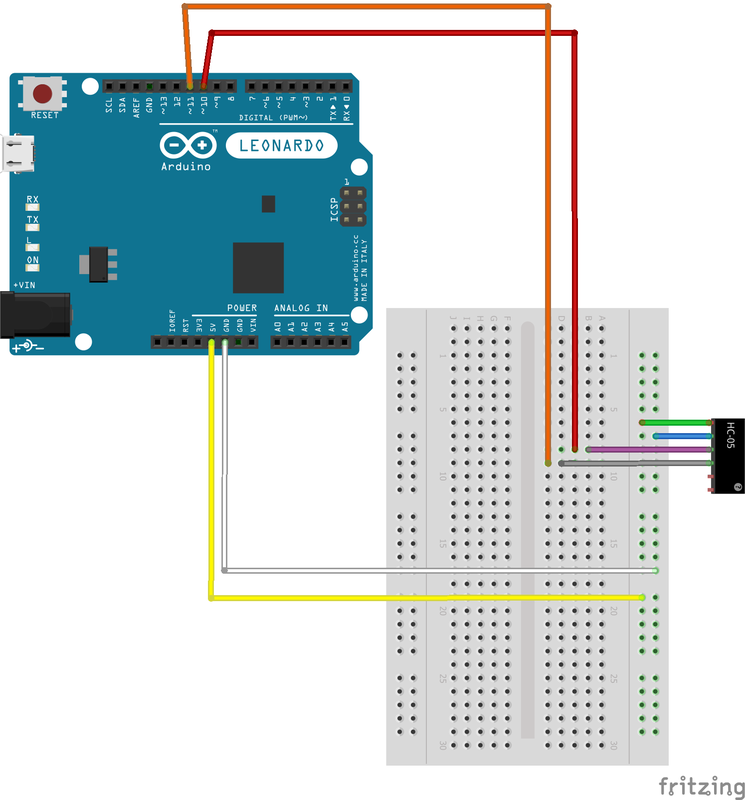 Now that our circuit is ready we can start writing the code for Arduino. Once the serial connection is setup, we have to monitor the incoming commands from the serial port. Notice that the first byte(s) we are planning to write the size of the command and then call the process command function. Different implementations are possible for the process command. I chose to use a pipe delimited structure that has the command in the first slot and the parameters for the rest. Example process command implementation would look like below (a simple implementation that writes the command and the parameters to the serial monitor. I am using the strtok function to tokenize the string. After the Arduino setup, it is time to write the universal app to connect to our gadget. Once I create the blank universal app from the default template, visual studio creates 3 projects for me. One for Windows 8.1, second one for Windows Phone 8.1 and the third one is the shared project folder. The project tree looks similar to the structure below. 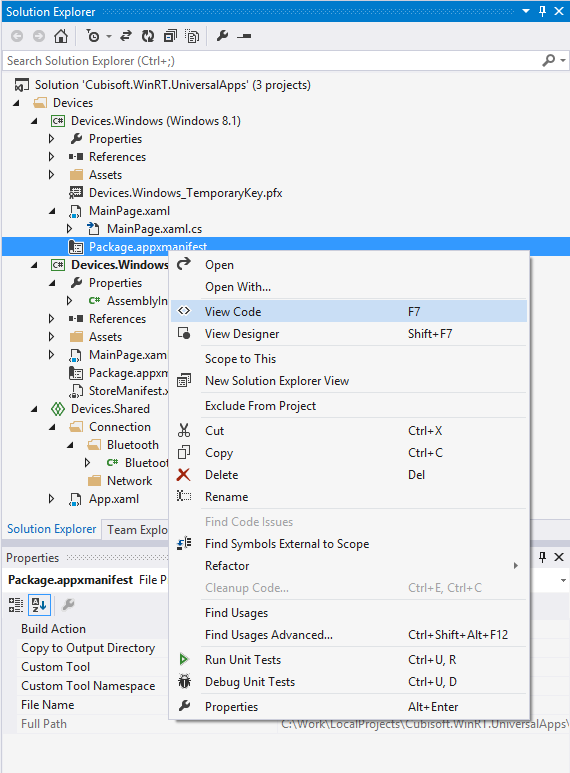 As you noticed I created the Connection folder in the shared project, hoping to use the same code for windows phone and the windows application to connect to the Bluetooth device. The first disappointment for me was the fact that DeviceInformation class does not work the same for windows phone and windows app. 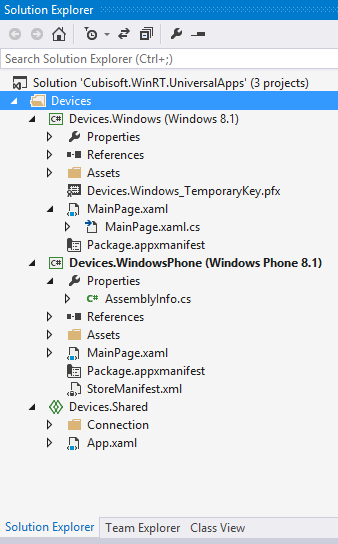 Even though the methods FromIdAsync and FindAllAsync are documented as supported for both devices, they do not give the same result for the windows phone. Considering the fact that windows phone runtime is still in beta, it might actually be fixed in the next releases. So I decided to use two separate implementations to discover the device host address (once the Bluetooth device is paired with my phone and the tablet). For windows phone application I had to use the PeerFinder class in the networking namespace to be able to enumerate the available devices and get the HostName. For windows, I am using the DeviceInformation class to get the hostname for the paired device. 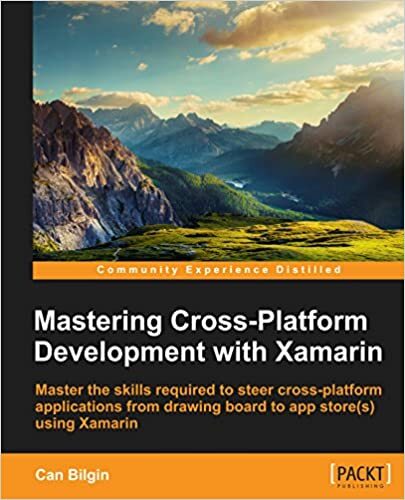 I think it is important here to mention that both for the windows app and the phone app, I had to define the package manifest entry to be able to use the device capability. In order to decrease the amount of the async calls chained together for connecting to the device I want, I wanted to discover the device hostname in the initialization of my Bluetooth channel and store in a member variable (i.e. m_HostName) together with the service name. So once the device is discovered, I can call the “Connect” function on my channel. Once I open my stream socket, I create a data reader and a data writer to communicate with the Bluetooth device. NOTE: It is important to note here that the Bluetooth connection should be (at least for the first time) executed from a UI thread. After the initial execution, a dialog comes up asking if I, as a user, want to allow this application to use the specific Bluetooth device. For receiving data, we will create a loop that will continuously poll the serial data reader and check if there is any data. //TODO: DO something with the received string. // Do not print anything here: the user closed the socket. I will try to document the implementation of this gadget with follow up posts. But for now this is about it. In my example, I hooked up the board to a 4 channel relay and connected with my phone using the channel implementation above.